After a series of bruising political battles over the past few years, the public’s desire for political compromise in Washington has increased notably. In March 2011, soon after Republicans gained a majority in the House, 54% said they liked elected officials who stuck to their positions, while 40% liked politicians who made compromises with people they disagreed with. Today, 50% say they like leaders who compromise, and 44% like those who stick to their positions. The percentages of Democrats and independents saying they prefer politicians who compromise has increased over the past two years. 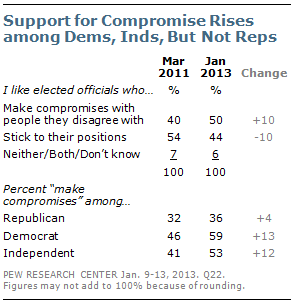 Currently, 59% of Democrats say they like elected officials who make compromises, up from 46% in March 2011. Similarly, there has been a 12-point increase in the percentage of independents expressing a preference for politicians who compromise (from 41% to 53%).